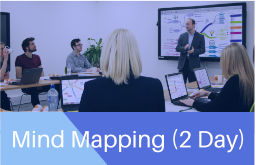 Fast-track your way to powerful new skills on the 2 day ThinkBuzan Official Mind Map Coach Course, endorsed by the creator of Mind Maps, Tony Buzan. 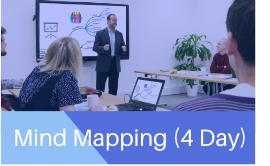 Delivered by Chris Griffiths, co-author of the best-selling book, ‘Mind Maps for Business’ with Tony Buzan, and creator of the iMindMap software, winner of Biggerplate’s Mind Mapper’s Choice Award 2016. Chris is also responsible for setting up the ThinkBuzan Global Trainers Network. Learn the core principles of Mind Mapping and how to facilitate creative thinking, problem solving and to manage yourself and others more productively. After the course, you will be able to apply your newfound skills to coach and consult others. Discover the science behind Mind Mapping and how to apply it to make any task more creative and productive. This advanced 4 day ThinkBuzan Licensed Instructor Course in Mind Mapping is the only course in the world certified and regularly led by the inventor of Mind Maps, Tony Buzan. You will become an Official ThinkBuzan Licensed Instructor in Mind Mapping, a globally recognised certification that provides you with the knowledge and skills needed to deliver your own ThinkBuzan certified 1 day practitioner courses in Mind Mapping and iMindMap. Want to broaden your skillset? We also have courses in Memory Skills, Speed Reading and Applied Innovation. Take a look at all of our upcoming training dates on our website. For more information, please contact the training team at training@thinkbuzan.com or call +44 (0) 207 1177 173 (intl.) or 1800 961 4582 (US). Dear Sir, \r\nI am interested to attend the 4-days instructor course . \r\nHowever, I am living in Singapore. May I know do you have any plan to hold such a course in Singapore or Asia in the near future ? Hi, our next 4 day course in Asia will be held in Japan on 4 – 7th November. For more information, contact our training team at training@thinkbuzan.com or call us on +44 (0) 207 1177 173 (intl). Hello,\r\nI am in Cameroon is there any online training? Thank you. I meant the one to become a certified Mind Map coach. My apologies, our next Mind Map Coach Course will be held in Singapore on November 15 – 16th and in Cardiff, UK on December 12 – 13th. In the new year we will be announcing more course locations and dates at our website. Unfortunately the content for the Mind Map Coach Course cannot be found online.